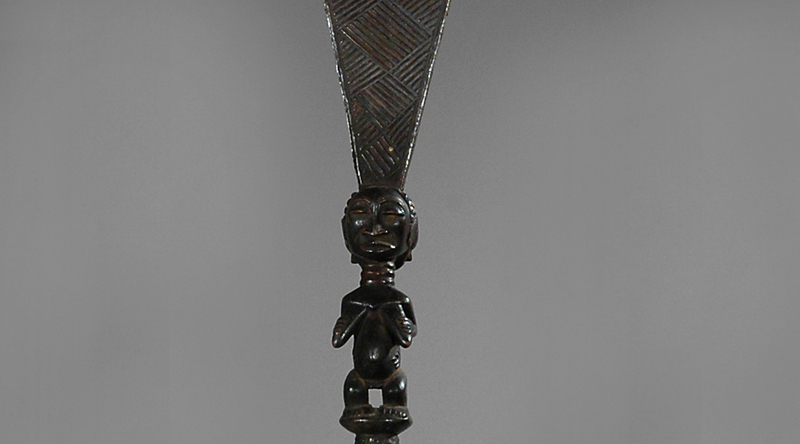 Sculpted staffs of office topped by a sculpted figure are known as kibango among the Luba. 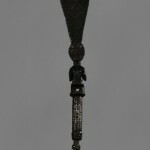 They serve not only to indicate a chief’s or titleholder’s rank and social status but equally serve as abstract devices to indicate their lineage history, genealogy, the history of the chief and their ancestors and serves as a residence of spirits. The designs and figures can be read by the chief and the spiritual medium that blesses the staff and loads it with magical and ritual properties. The magical powers and prayers embedded into the staff can cure and protect those whom the chief administers. 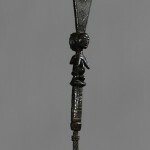 The female figure at the top of the staff represents the unique nature of Luba chieftaincy for it is thought by the Luba that the king’s spirit is split between the female and male bodies and thus chiefly power is shared and interdependent. The figure is seated with her hands on her brests. 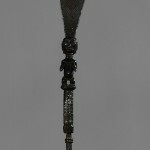 On this staff one my read from the top to the bottom that the chief rules on the behalf of the ancestors. 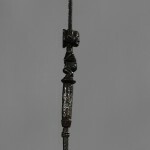 Such staff are not common and this particular piece is a good example of these carvings.